When yoga first entered the American popular consciousness in the late 1960s and early 1970s, most practitioners of the discipline lived in major metropolitan areas such as Hollywood, New York, and San Francisco. Over the next few decades, yoga experienced a rise in popularity driven by America's increased interest in fitness and exercise. Despite being first introduced to America nearly a century earlier by Swami Vivekananda, by the 1990s, yoga had officially arrived. Today, with over 36 million practitioners — 72% of whom are women — yoga is one of America's fastest growing sports and one of its fastest growing industries. But is the practice equally popular across the United States? At POPSUGAR, we have a tremendous amount of data about which topics most interest our readers, who are primarily female. By collecting data on the geographic locations of the millions of visitors to our network, we can determine where people are particularly interested in a specific topic. We dove into this data in order to understand where yoga is trending and where it's rare.According to our data, the US cities with the highest interest in yoga are Western cities Denver, Portland, and Salt Lake City. Yoga is less popular on the East Coast and in cultural centers like Los Angeles, New York, and Miami, where people are more likely to be reading other material on POPSUGAR. In the first quarter of 2015, a very significant percentage of page views on our network were for articles about yoga. But that percentage varied significantly across American cities. 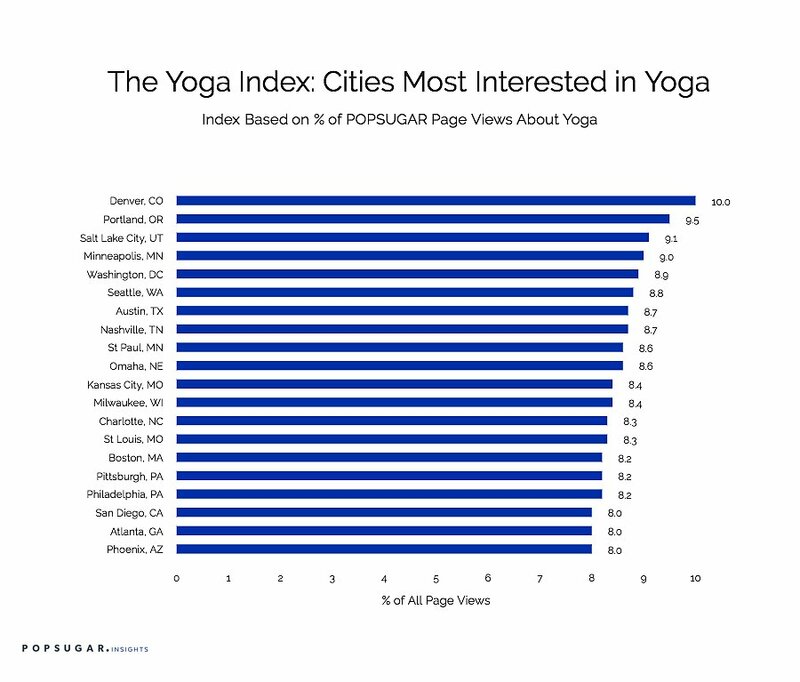 It turns out that people in Denver who visit POPSUGAR are more than 50% more likely to read an article about yoga than people in Los Angeles or Miami. 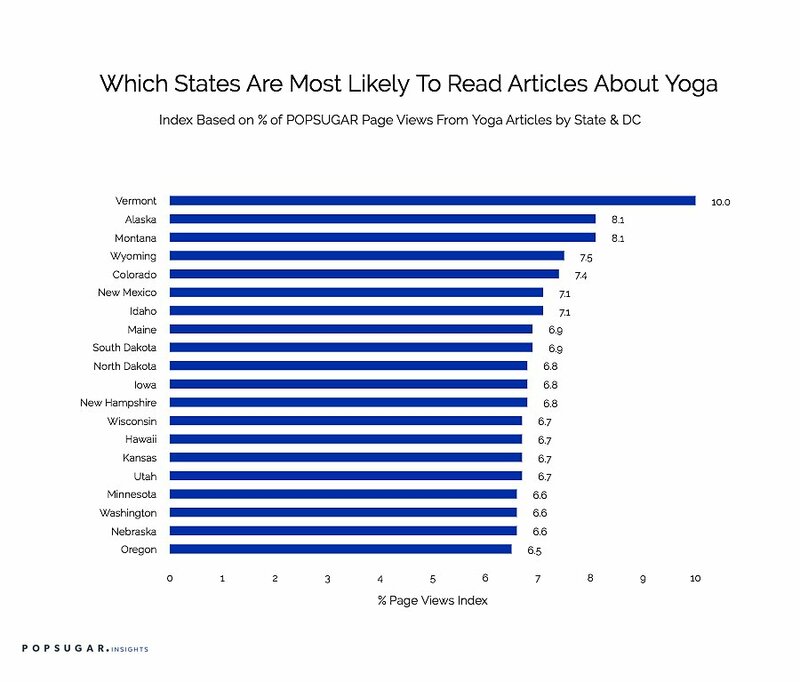 The following table shows the 20 cities whose residents are most likely to be reading articles about yoga compared to other POPSUGAR articles. Denver, which consistently ranks as one of America's healthiest cities, comes out on top as the most yoga-crazed city. It is followed by other cities known for their residents' active lifestyles, like Portland, Salt Lake City, and Minneapolis. New York, Miami, and Los Angeles rank at the bottom of the list. In these cities, readers are more interested in articles about fashion and entertainment than yoga. Vermont is the number one state by a long shot. The state, which is known for its countercultural tendencies, is home to some serious yoga lovers — and even to an annual yoga-centered festival. After Vermont, Alaska and the states of the Pacific Northwest rank highest. 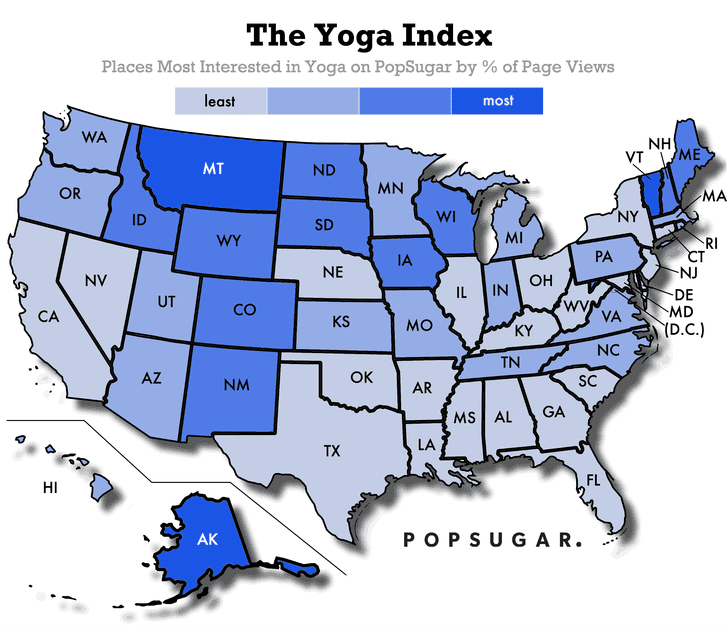 In general, our data shows that interest in yoga is strongest in the West. This contrasts with other sports like running. 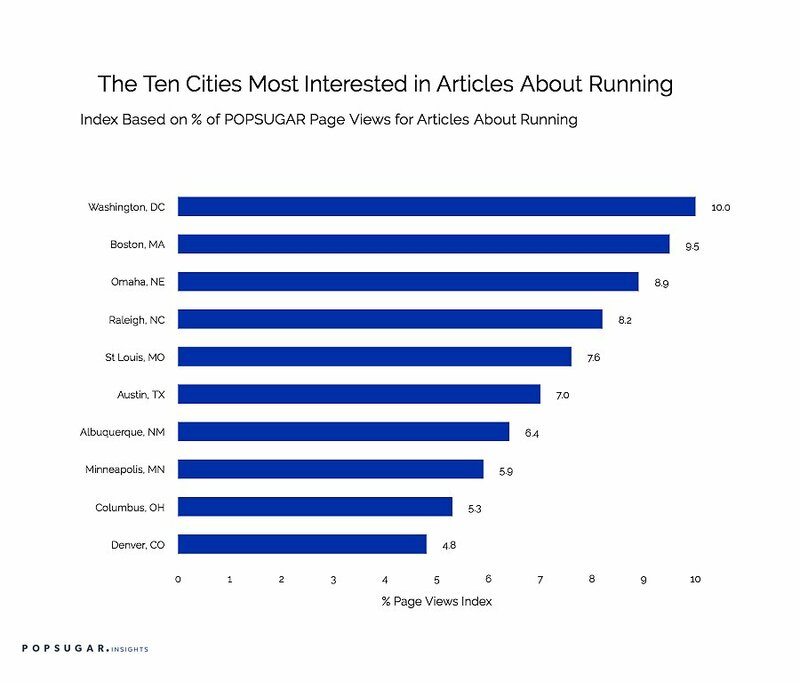 As the chart below shows, running is most popular among our readers from the East Coast cities of Washington DC and Boston. While yoga's rapid rise to popularity has changed how many Americans exercise, it has also changed how we dress. The trend of wearing athletic clothes all day — whether you're exercising or not — has been fueled by the popularity of yoga pants and leggings. On POPSUGAR, the rise of yoga pants and "athleisure" clothing has led to an increase in the number of articles tagged under the heading "leggings." These are the 10 cities with the most people reading about leggings and yoga pants. Californian cities and New York and Brooklyn all rank highly, with San Francisco taking the top spot. 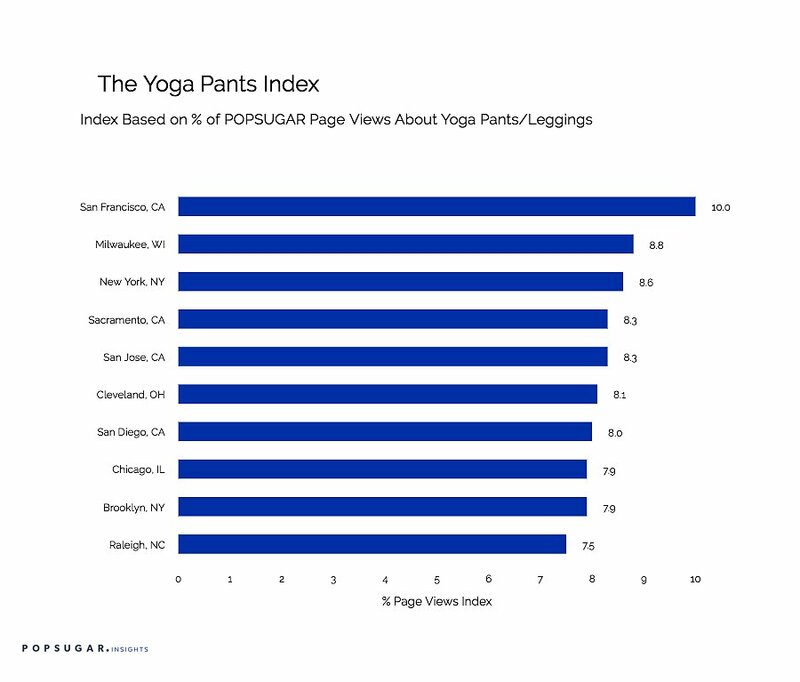 It's a testament to the growth of yoga in America that it's unclear whether San Francisco's top ranking on the yoga pants index supports its traditional counterculture image or whether it indicates that San Francisco and yoga pants have gone mainstream together.